In the past month, we’ve explored 5G, or fifth generation cellular technology, and how 5G will shape the future. In this piece, we’ll spotlight the many ways in which 5G will revolutionize the healthcare industry. Many medical machines like MRIs and other imaging machines generate very large files that must then be sent to specialists for review. When operating on a network with low bandwidth, the transmission can take a long time or not send successfully. This means patients must wait even longer for treatment, inhibiting the efficiency of healthcare providers. 5G networks will vastly surpass current network speeds, enabling healthcare providers to quickly and reliably transport huge data files, allowing patients and doctors to get results fast. A study by Market Research Future showed that the future of telemedicine is bright—an annual growth rate of 16.5% is expected from 2017 to 2023. 5G is among the primary reasons for that level of growth. 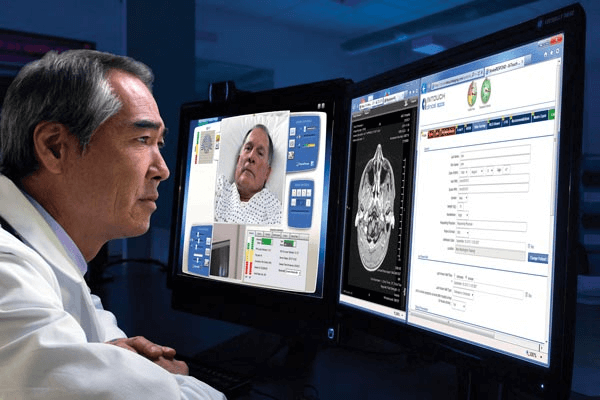 In order to support the real-time high-quality video necessary for telemedicine to be effective, hospitals and healthcare providers will need 5G networks that can reliably provide high-speed connections. Telemedicine will result in higher quality healthcare in rural areas and increased access to specialists around the world. Additionally, 5G will enable growth in AR, adding a new dimension to the quality of telemedicine. It’s no secret that 5G will enable incredible innovation in the IoT space. One of the ways in which IoT will enable more personalized healthcare involves wearables. According to Anthem, 86% of doctors say wearables increase patient engagement with their own health and wearables are expected to reduce hospital costs by 16% in the next five years. Wearables like Fitbit track health information that can be vital for doctors to monitor patient health and offer preventative care. While the impact may initially be negligible, as technology advances and more applications for gathering data through wearables emerge, 5G will enable the high-speed, low-latency, data-intensive transfers necessary to take health-focused wearables to the next level. Doctors with increased access to patient information and data will be able to monitor and ultimately predict potential risks to patient health and enact preventative measures to get ahead of health issues. Companies like CommandWear are creating wearable technology that helps save lives by enabling first responders to be more efficient and more conveniently communicate with their teams. In the future, artificial intelligence will analyze data to determine potential diagnoses and help determine the best treatment for a patient. The large amounts of data needed for real-time rapid machine learning requires ultra-reliable and high-bandwidth networks—the type of networks only 5G can offer. One potential use case for AI in healthcare will be Health Management Systems. Picture a system that combines the Internet of Things with cloud computing and big data technology to fully exploit health status change information. Through data-mining, potential diseases can be screened and alarmed in advance. Health Management Systems will gradually receive mass adoption as 5G enables the data-transmission speeds necessary for machine learning to operate in the cloud and develop algorithms to predict future outcomes. Right now, the major players who serve to benefit from 5G are the telecom companies developing technology that will enable mass adoption. Companies like Huawei Technologies, Nokia, Ericsson, Qualcomm, Verizon, AT&T, and Cisco Systems are investing massive sums of money into research and development and patenting various technologies, some of which will no doubt become the cornerstones of the future of healthcare. Qualcomm recently hosted a contest to create a tricoder—a real life device based on a machine in the Star Trek TV movie franchise. Tricoders are portable medical devices that would enable patients to diagnose 13 conditions and continuously monitor five vital signs. For a full list of major players in the 5G game, check out this awesome list from GreyB. With human lives at stake, healthcare is the sector in which 5G could have the most transformative impact on our society. As the Qualcomm Tricoder contest shows, we are gradually building toward the society previously only dreamed about in sci-fi fiction–and 5G will help pave the way.